Mr. Mladenov began his downbeat assessment by detailing the extent and growth of Israeli settlements in the occupied West Bank: the UN’s long-standing position on settlements, he reminded the Council, is that they are illegal under international law and “an obstacle to peace.” Recent examples include plans for over 3,000 housing units in West Bank settlements, and government plans to legalize several illegal outposts. 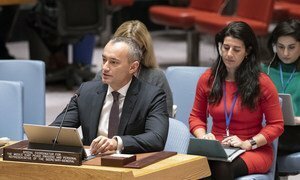 At the same time, said Mr. Mladenov, Palestinian-owned structures have been demolished and seized across the West Bank, including East Jerusalem, with authorities citing a lack of Israeli-issued building permits, which are nearly impossible for Palestinians to obtain, as justification. It is ordinary Palestinians, said the Special Envoy, who are bearing the brunt of the suffering, and the humanitarian situation in Gaza remains “desperate” : economic growth is insufficient to keep the Palestinian economy afloat, and the UN is working with the Palestinian Authority to address some of Gaza’s most pressing needs, such as maintaining an electricity supply, delivering essential medicines and implementing cash-for-work programmes. Recent violence and rising tensions in the West Bank are fuelling a climate of hatred and fear, “driving both Israelis and Palestinians further away” from a resolution to the conflict, the United Nations envoy for the Middle East Peace Process has said. 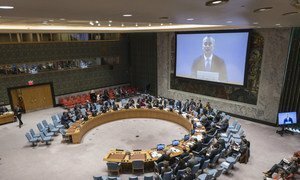 A senior United Nations official has called on the global community to remain committed to the two-state solution in the Middle East peace process, urging efforts to establish an environment conducive to the return of negotiations to resolve the Israeli-Palestinian conflict.